Hong Kong is a thriving city full of companies that draw workers from all around the world. Expatriates arrive ready to work for six months, a year or maybe more. Those who have families bring them to experience this new culture. They try to assimilate into this new world but tend to cling to their small expat communities to hold onto some feeling of home. Mercy, Margaret and Hilary are three expatriates whose lives intertwine in this expat community. 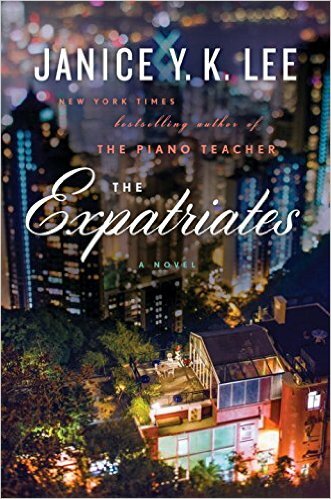 The Expatriates by Janice Y.K. Lee brings us into the lives of these three women, alternating chapters between them. Margaret and Mercy are both trying to overcome a tragedy that took place about a year ago. Neither seems to be able to move forward with their lives. Hilary is dealing with marital problems and longing for motherhood. They all come together in the end, but I can't tell you how! I will say that I enjoyed all of their stories, but I felt like something was missing. I was looking for more emotion or depth of character. While we learn a bit about each woman, and what they deal with is emotional, I didn't feel very connected to them. Lee also provides glimpses of other expats, including the husbands and neighbors of Margaret, Mercy and Hilary. We get little bits of details about how some expatriates adapt and the difficulties they face. And we learn that many end up with servants in their homes in Hong Kong because that's just the norm, although this is often uncomfortable for the women as we see through Margaret's and Hilary's stories. I enjoyed these little facts because I was expecting the novel to be more about the challenges of being an expatriate. It turned out to be more of a women's fiction novel that focuses on marriage and motherhood. Overall, The Expatriates is an interesting look at three women's lives, and their struggles with marriage, motherhood and life in a new country. This review was written based on a copy of The Expatriates that I received from the publisher in exchange for an honest review. This post includes Amazon Affiliate links. If you purchase something using my link, I will receive a very small commission but your price does not change.